A combination of a source capture air filtration system and a stand alone recirculating air purifier could be a good fix to reducing your exposure to unhealthy chemical fumes, gases, odors, as well as fine airborne particulates. A source capture unit like our SolderPure unit can be used to capture air coming out of the exhaust port of your printer or photocopier. The SolderPure is equipped with a dust particle pre-filter, a HEPA filter (down to .3 microns), and a 2″ activated carbon filter. 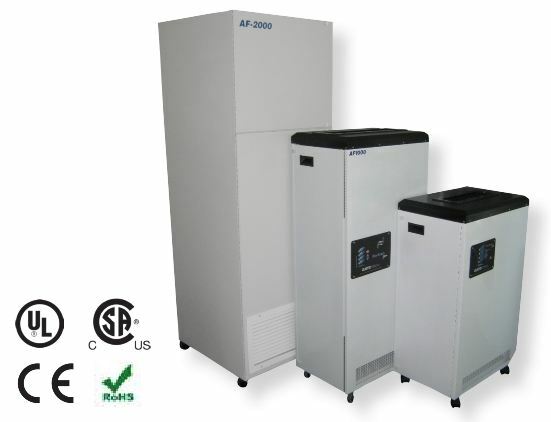 A stand alone recirculating air filtration system like our BP2000 series would be a good addition and / or a great compliment to the overall solution of reducing ones exposure to these pollutants – airborne particulates and airborne chemical gas, fumes, odors. 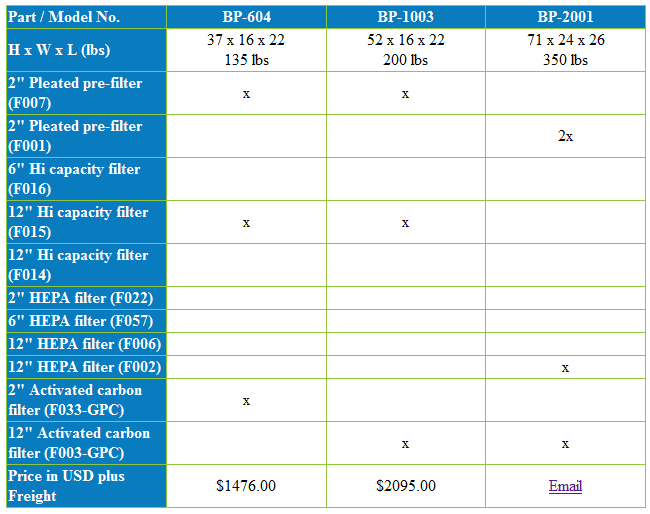 The BP2000 series offers a wide range of filter configurations. A multi-stage air filtration system using HEPA filter and Activated Carbon Chemical Odor filters can help improve the indoor air quality in your printing or photocopying room. Call for us for help in choosing the right air filtration system for you. Toll free: 1-800-626-0664. The first type of system provides humidity control for the print environment. The second type of system is our Fresh Air series which can provide air recirculation for both dust control (Hepa filters capture 99.97 % of particles as small as 0.3 micron) as well as VOC and odor control. As most large format printers are aware, off-gassing from the print material doesn’t stop the instant that the material has printed. As one of our first products 19 years ago Quatro Air has shipped Fresh Air purifiers to thousands of print houses around the world. The third type of equipment is used in ablative processes such as CTP; the AF400, AF800 and the CSA can be used in these applications; talk to our experts to see which solution best fits your application. The fourth type of system provides dust free positive or negative pressure environments for specific print applications as well as new innovative technology geared towards odor removal. We offer some standard units with a combination of easily replaceable pre-filter sections, true HEPA filters and activated carbon for VOC and odor elimination. For customers who produce a lot of particulate material we have a number of solutions with large, easy to replace dust bags that can capture a tremendous amount of particulate without reducing the effectiveness of the system. All of our systems are UL/CSA/CE certified and are available in 110V or 230V versions for shipping internationally. Call us today about your printing application, no one has more experience in the print industry when it comes to clean, odor-free air. Assuming the ceiling height is between 8’ to 10’ high, a couple of the BreathEasy Pro series, BP-2001, would be good. Digital print shop, mild solvent printer, a UV flat-bed printer – air cleaner, air purifier, air filtration system needed to help remove and / or reduce VOC levels in the air.